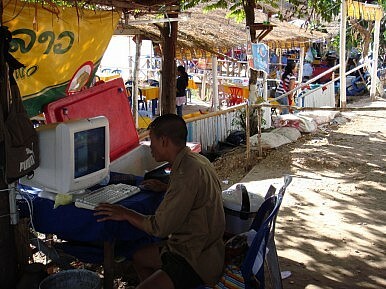 Laos has virtually no restrictions on internet use. The only problem is that few have any internet access at all. Internet users in Laos were estimated at only 7 percent of the population as of 2010, the last time this data was gathered. But despite how low this seems, that’s still double the number of users there were in 2008. And, as the economy continues to grow, internet usage is steadily climbing in Laos. Meanwhile, more and more citizens are using cheap smart phones imported from neighboring countries and other means to access the internet. Even in small towns, internet access points – generally small rooms with 4 to 10 computers – are popping up. The audience is often young boys playing video games. This isn’t surprising since there’s so little information available online in the Lao language. The website www.lao44.org is the cyber embodiment of that constitutional right. Lao44.org (Lao44) is the biggest digital library in the Lao language, and was the first-ever Lao language discussion board. And it remains an active forum: according to the website counter, there were 1,001 visitors on the day of writing this article. They also have 1,963 documents, including articles, laws, reports and student theses on issues ranging from agriculture, health, and planning to almost anything imaginable. There are 345 videos. One of the most popular general comments on the site is people saying that they were unable to find a particular document anywhere, but that they then were able to find it on Lao44. The webmaster will also seek out documents at the users’ request and post them on the site. Users range from students and civil society leaders to government ministers. It’s perhaps this broad range of users and supporters that enable the site to address topics sometimes deemed too sensitive for discussion in this one-party state. For example, the site homepage currently poses the survey question “Do you want the news talk radio program to come back?” which refers to the popular radio call-in program that recently disappeared from the air without warning or explanation. The Asia Foundation is currently supporting CLICK to increase the site’s usage by university students and faculty, and to increase the number of university theses and articles uploaded to the site’s library. We’ve also been working with the National University of Laos’ Central Library – the largest academic library in the country – to help provide appropriate technology and raise the IT skills of the library staff to better enable them to find information and help students and faculty. One training session taught staff how to search for articles online, how to upload files, and how to subscribe to listservs in order to get updated information. Another taught the staff how to use new digital library software, Dspace. “In the past, librarians wasted a lot of time filing, which resulted in slower service for customers and occasionally lost books. The new software will eliminate these problems,” the library director, Chansy Phuangsouketh, told the Vientiane Times. More than 500 students use the library each day, rising to 1,000 during exam periods. Ensuring that citizens have access to information and educational materials, as well as spaces such as these where they can discuss important issues, will be critical to all aspects of Laos’ ongoing development. Gretchen Kunze is The Asia Foundation’s country representative in Laos. She can be reached at [email protected]. The views and opinions expressed here are those of the individual author and not those of The Asia Foundation. This article originally appeared on the Asia Foundation's blog.